By Liam Walsh, RPS Group. Barcelona or Shanghai? Bondi or Chatswood? 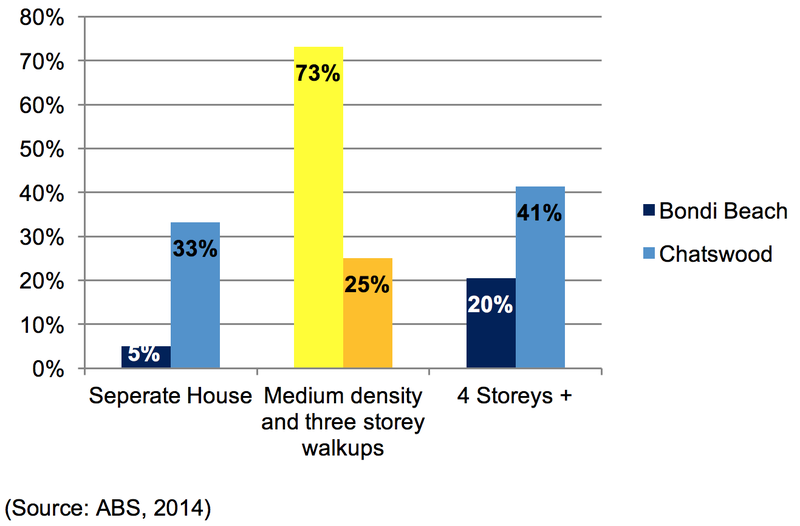 Delivering housing density in Sydney doesn’t have to mean reaching for outer orbit. Sydney is reaching a cross roads on delivering new infill housing. This week, the Minister for Planning, Rob Stokes has noted his preference for Sydney to increase housing density through a ‘Barcelona’ model -encouraging more medium density and terrace houses. The Urban Taskforce CEO Chris Johnson in a reply article in the Urban Developer noted a high rise ‘Shanghai’ model could be adopted for Sydney to attract the energy of emerging Asian Cities. In a Sydney context it looks more like either a Barcelona model or a mixed Shanghai/Dallas model of density. A Barcelona model like Bondi comprised of a dense medium core with scatterings of low rise and high rise, especially at Bondi Junction. Or a Shanghai/Dallas model like Chatswood, with a skyward bound core to protect the low rise and very low density outer. The key outcome of applying the Barcelona or Shanghai model to Sydney is to understand what accommodating future growth physically looks like. The European city model is dense, just not especially high. It is a consistent density that allows both low and high rise in the right places, but on the whole supports a middle height and scale of housing which is very dense, but doesn’t necessarily feel like it is. Bondi has a fantastic diversity of housing from lower rise homes in North Bondi, the dense middle core of the beachside and Bondi road and the Victorian terraces, walk-ups and high rise of Bondi Junction. 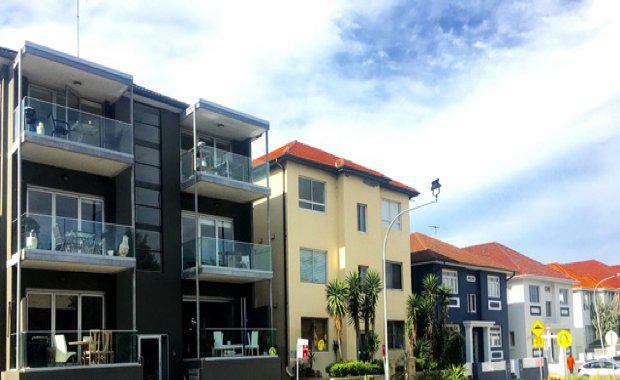 In the suburb of Bondi Beach, the streets are an Australian version of Rob Stokes Barcelona model of density. The streets run west or parallel to the famous beach and accommodate a diverse array of attached homes, terraces, two and three storey walk ups and some larger flat buildings up to eight storeys. There is high energy, an immense array of services for locals and tourists alike, but with a built form that allows sun to penetrate the streets, ground floor back gardens even in apartments and a leafy streetscape. Yet Bondi Beach, like many European cities with a middle core is incredibly dense without feeling like it is. With a population of 10,772 in just 1.18 square kilometres, it has a population density of nearly 10,000 people per square kilometre. This level of density in a global city context means if it were a London Borough, it would rank 13th out of 34 in terms of density per square kilometre. The opposite and increasingly common outcome in Sydney is the Shanghai/Dallas model that is Chatswood and many other suburbs. While Chatswood should expect to accommodate higher density in it’s centre like Bondi Junction, the core is now reaching outer orbit to protect the untouchable outer ring of low rise suburbia. This model delivers a far lower population and dwelling density. It would rank 29th if it were a London Borough. Moving forward, planning for Sydney’s future growth needs to consider what the physical outcomes look like and what a desired model of growth is for Sydney. There is the Chatswood model applied in multiple suburbs to increasingly give way to skyward towers to protect suburban streets. This model burdens the growth on a small geographic area and offers little diversity between either very low or very high density. Applying the Bondi model across Sydney could allow a gradual infill of terraces, walk-ups, manor homes and some higher rise apartments across suburbs depending on financial viability and suitability. This could enable growth and reach higher densities, while maintaining sunlit streets, suburban character and diversity from low through to high, not just low or high? Liam Walsh is part of RPS’ Sydney-based strategic property advisory team. He coordinates projects where a combination of urban planning and property market influences need consideration. Liam works primarily across residential, seniors living and retail markets, with significant involvement in land release.